I’m contemplating this question for a few reasons, the first of which being the low voltage seen at startup in the video. This battery came with the bike; both are 39,000 miles and five years old now. They’ve seen hundreds of starts, charges, and discharges. And while the battery still starts the bike, it doesn’t do so as strongly as I would like. The voltage drop seen in the video is significant. The meter shows 12.5v with the key off. Voltage then drops to 12.0v with the key on and falls to as low as 8.24v while cranking. Starts are sluggish even in warm weather if I fail to continuously charge the aging battery with a solar panel. I’ve read that a cranking voltage below 9 is indicative of a failing battery. Could this battery fail at the worst possible moment when a new battery is near-impossible to find? And would a new battery now do other things for me that this one does not, such as power my electronics at camp and still start the bike the next morning? I think the answer to these questions is yes. Fortunately, I’m not without options. Unfortunately, I tend to overthink my options like so many other riders who spend more time thinking about riding than they spend actually riding. Forum inmates at advrider.com have exhausted the Which battery is best? question many times over. There are a few basic schools of thought. Stick with original equipment and buy an AGM lead-acid battery for the least cost (about $70). Upgrade to a better AGM lead-acid battery for a little more ($75) or a lot more (about $125). Or, switch to a lithium-iron-phosphate (LiFePO4) battery for no less than three times the money ($230 to as much as $470). All options have strengths and weaknesses in addition to cost considerations. The Yuasa YTX14-BS maintenance-free battery sells for cheap on Amazon and ships for free. Buying this battery from BMW doubles the cost. Using this battery assures me of the most similar experience to my baseline–five years of the bike starting when I want it to start, even at below-freezing temperatures, with a battery I know. This battery also affords me a few hours of gadget charging at camp without risking a dead battery in the morning. The Deka ETX14 (rebranded as Big Crank) sells for a bit more on Amazon than the Yuasa and also ships for free. This battery receives rave reviews as an excellent low-cost upgrade to the OEM battery. It weighs a bit more but offers a 10-percent boost in cranking power. The Odyssey PC535 powersports battery costs a bit more, and Amazon ships it for free. The technical specs of the Odyssey are very similar to the Yuasa, and yet people rate its cranking performance and ability to deep-cycle discharge as much better. However, this battery does not fit my bike without modification. Lithium power sport batteries represent the latest evolution of battery. Their chemistry is similar to that found in power tools. They are smaller, lighter, and more powerful than lead-acid batteries. In addition to being new, they are also incredibly expensive and sensitive to temperature and charging conditions. In other words, they’re finicky and untested in the field. The collective effort of a few generous people on the advrider.com forum has produced this incredible, real-world comparison of popular lithium power sport batteries. User JoelWisman asked the question is lithium up to the challenge of adventure touring? and posted video tests and lengthy descriptions of his answer. Twenty-nine pages later, that answer is… maybe. While the technology behind all lithium batteries is similar, not all lithium batteries are created equal, and not one is created well enough to meet all the demands of adventure touring. Some are waterproof, and others are not. They use different cell configurations. Some maintain cell voltage balance (which ultimately affects overall performance) while others do not. Only one manufacturer builds an internal control into its batteries to regulate this balance and safeguard against overcharging and over-discharging. All others require an external battery tender and a degree of user awareness to avoid ruining the battery with excessive loads or voltages. Oh, and no lithium battery likes the cold. These are very important concerns for adventure riders who sink their bikes on water crossings, who don’t have access to a battery tender, who overload their bikes with power-hungry gadgets, and who often ride in freezing temperatures. Lead-acid battery manufacturers have addressed all of these issues and proven the technology’s ability to perform. After all, theirs is a technology thousands of years in the making. The bottom line is this: lead-acid batteries will work and charge in the worst of conditions while lithium batteries might not. In Joel’s opinion, lithium could be ready for the rigors of adventure touring once manufacturers address all of these issues. Unfortunately, a single manufacturer has yet to do this. Joel reports that the Shorai batteries he tested leak. EarthX and Ballistic batteries might leak given that their warranties specifically exclude damage from immersion. Only Antigravity promises waterproofness. Ballistic, Shorai, and Antigravity batteries might suffer from voltage imbalances over time if not externally maintained. Only EarthX offers the internal battery management system to prevent this. And only EarthX batteries claim protection against over and under voltage conditions. What about these batteries’ advertised power ratings? To compare actual versus stated cold-cranking-amps, Joel put three batteries through a series of bench tests. His on-camera test subjects for the 200-amp sustained load test video include a two-year-old Yuasa YTX12 lead-acid battery, a five-month-old Deka ETX14 lead-acid battery, and a five-month-old Shorai LFX18 lithium-iron-phosphate battery. His off-camera tests of brand new Shorai LFX18 and LFX21 batteries produced similar results. His summary concludes that the Shorai batteries perform at a much lower CCA than advertised, and they significantly underperform the $75 lead-acid battery from Deka. The Shorai battery dropped below the critical voltage needed to even engage a starter motor within the first ten seconds of the first 200-amp test–a failure not seen with the lead-acid batteries until the ninth load test. 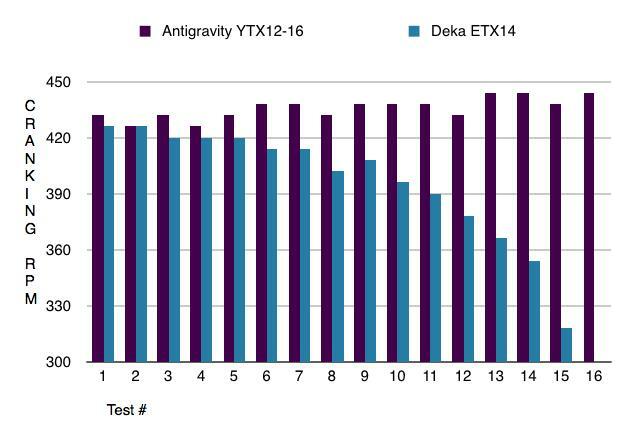 Joel also stress-tested the Deka ETX14 against an Antigravity YTX12-16 lithium battery. His on-camera test involved counting compression strokes and measuring voltages while continuously and repeatedly cranking a 1000-cc Aprilia Caponord with each battery. The results are impressive. He achieved an incredible 15 consecutive 10-second engine cranks before the Deka would no longer engage the starter. He then repeated this test for the Antigravity YTX12-16 lithium battery, which after 16 cycles, showed no signs of quitting or losing voltage. In fact, the Antigravity battery maintained its cranking amps throughout the test, and its voltage increased or stayed the same. The Deka lead-acid battery slowly lost its ability to deliver cranking amps, and its voltage tanked until failure. A video of the test is available on YouTube. Without additional tests (for the other batteries in the market), a complete and fair comparison is impossible at this time. Joel’s limited tests do confirm, however, that Antigravity lithium batteries are strong performers. His tests also confirm that lithium outperforms lead-acid when the technology is delivered in a quality product. Cold-weather performance and long-term durability are yet unverified, but initial feedback from the few adventure riders who tour with Antigravity batteries is positive. While taking a lithium battery around the world may be out of the question today, Antigravity is well on its way to making their batteries fit for a world tour. They seem confident and devoted to making a quality product. Their industry-leading, 3-year, full-replacement warranty speaks volumes about their confidence. Lithium can do for us what lead-acid cannot. It can feed our electronics and then effortlessly start our bikes. For now, lithium does this at a very tall price when acceptable performance is available from lead-acid for a fraction of the cost. If I were to choose a lithium battery today, I would buy an Antigravity for its proven performance and purported durability. But because of the expense, I would instead choose a strong-performing lead-acid from Deka or Odyssey. What the adventure touring community needs is for early adopters to take these batteries into the field and use them. We need to report our concerns to the manufacturers so they can better their products. As more people use the technology, prices will fall! Lead-acid took 2000 years to perfect and become affordable. Let’s not wait so long for lithium. Hey great battery when works. But mine failed/cooked after 2.5 years of light use ok so it happens. But there 3 year weak warranty as a 25 percent prorate was offered on a two hundred dollar plus battery stinks imo. Also I sent back my VR bought from Ricks Motorsports to see if it could be the culprit. It was bench tested and sent back fine. Anyhow just one guys experience with the people at antigravity batteries. Some might be satisfied with getting 2.5 years or 5,000 miles out of a battery. Very useful summary, thanks. I need to check which brands are available in Europe. But my feeling is that these lithium batteries are still too risky for adventures. Very true, Christophe! They’re so easy to want right now but the technology really needs to settle down first. The unfortunate thing is that the subtle advances, tweaks, and differences between manufacturers are not generally published. This makes comparing them on their guts and performance difficult.